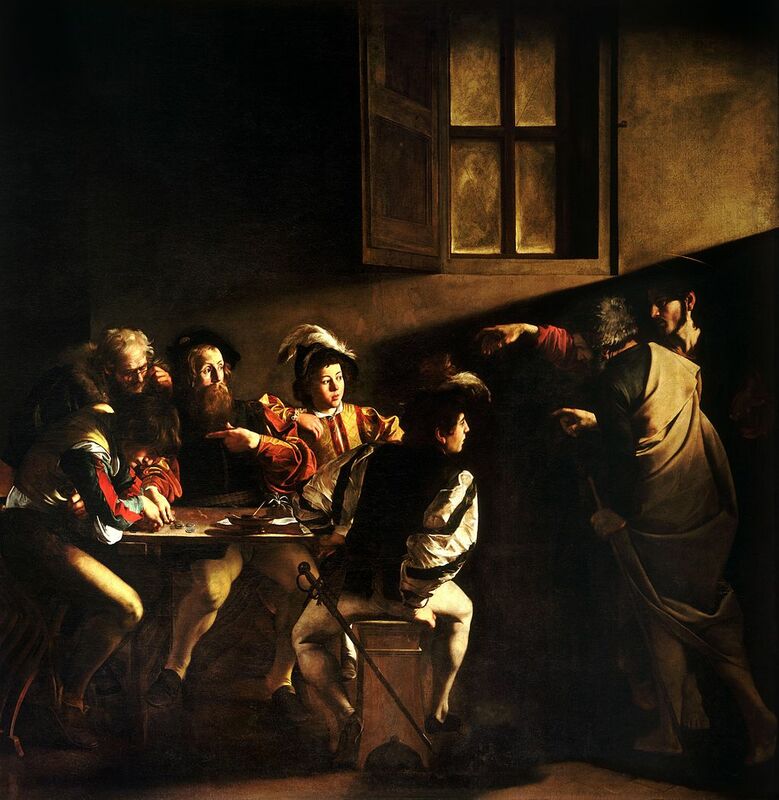 Caravaggio’s masterpiece The Calling of Saint Matthew captures the birth of a vocation and an encounter between God and man. It reveals a dramatic moment in which two persons meet and two separate worlds converge. With his characteristic realism, he visualizes a spiritual event and portrays the dynamism of a personal epiphany. Matthew, absorbed in his world of money and friends, is caught off guard. A ray of light illuminates the features of his surprised face. He points towards himself to inquire if he is really the one being addressed by Christ. He leans away from Jesus, but his legs seem poised to get up and move towards him. We see tension and surprise before an unexpected and radical invitation. This is a watershed moment in which Matthew’s life teeters between two possibilities. He must make a decision either to continue clinging to his money or to follow the beckoning Galilean. He is a tax collector; up until this point, his life has been centered on money. A coin is stuck conspicuously in his hat, symbolizing the privileged place that money holds in his thoughts. With his right hand, he reaches for coins. If Matthew decides to heed the call of the austerely dressed Christ, he is going to have to give up something that has become central to his very identity. There is another element in his life opposed to the possibility of him following Christ: his friends. They surround him and lean on him, almost protectively, forming a barrier between him and the uninvited visitor. The young man with the sword is about to get up from his stool, leaning towards Peter in a mildly aggressive manner. To follow Christ, Matthew will have to extricate himself not only from his internal attachment to money, but also from the external pressure of his friends. The men in the left of the painting are a reminder of Matthew’s past — and of his possible future. They are hunched over their coins, completely oblivious to Christ. Their opportunity for a new, more meaningful life fades away as they continue counting silver. If Matthew does not respond to Christ, he will remain a sad miser like them. Christ and Peter stand in stark contrast to Matthew and his companions. Their bare feet and simple clothing clash with the flamboyant colors of the tax collectors’ fashionable, 17th-century attire. Peter’s walking staff indicates their itinerant status: They are always on the move with no place to lay their heads. If Matthew follows Christ, it will not be easy. He will have to leave behind his luxurious lifestyle, stable income and even the benefit of proper footwear if he is going to be counted among the followers of this poor yet captivating man. The contrast between Christ’s holiness and Matthew’s worldliness reflects contrasting elements of the artist’s life. 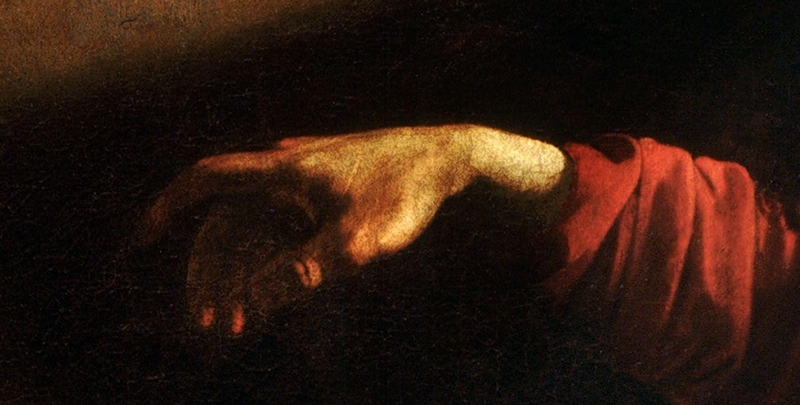 Although his works depict saints and communicate profound spiritual realities, Caravaggio himself was far from angelic. His short life (1571 – 1610) was a paradox of great success and self-inflicted failure. Despite the popularity that he enjoyed among the Roman elite, time and time again his nasty temper and rowdy night life landed him in courts and jails. His misdemeanors ranged from consorting with prostitutes to throwing artichokes at a waiter. But the climax of his crimes occurred in 1606: he murdered a man in a violent duel. Forced to flee Rome, Caravaggio died of a fever four years later after a series of unfortunate events, much to the glee of his enemies and the sorrow of his admirers. In the painting, Christ did not hold himself aloof from the worldly Matthew, but takes the initiative to approach him personally. God works through weak instruments. Like the rays of light in a typical Caravaggio work, God shines through the weakness of human nature and uses flawed individuals to communicate his own goodness to the world. He used a troubled artist to create beautiful, spiritual paintings that 400 years later do not cease to inspire and awe. He used a sinful tax collector to write his Gospel. Matthew has to make a decision soon because Christ is on his way out the door. Even as he calls Matthew, he is stepping away from the table, adding a sense of urgency to the moment. Christ is calling, but not waiting. His left hand is open and motions in the direction he is going, and his right hand points dramatically towards Matthew. In addition to the personal call of Matthew, this painting has a deeper meaning. It illustrates the new relationship between God and man made possible by Jesus Christ. Before the coming of Christ, there existed an infinite abyss between the Creator and humanity. It was traversable only by someone who was a part of both worlds, i.e. a God-Man. Jesus Christ, the Word made flesh, bridges this gap. A space of darkness, situated between Christ’s group and Matthew’s group, symbolizes this great divide. The darkness is bridged by the extended hand of Christ, the Light of the World. 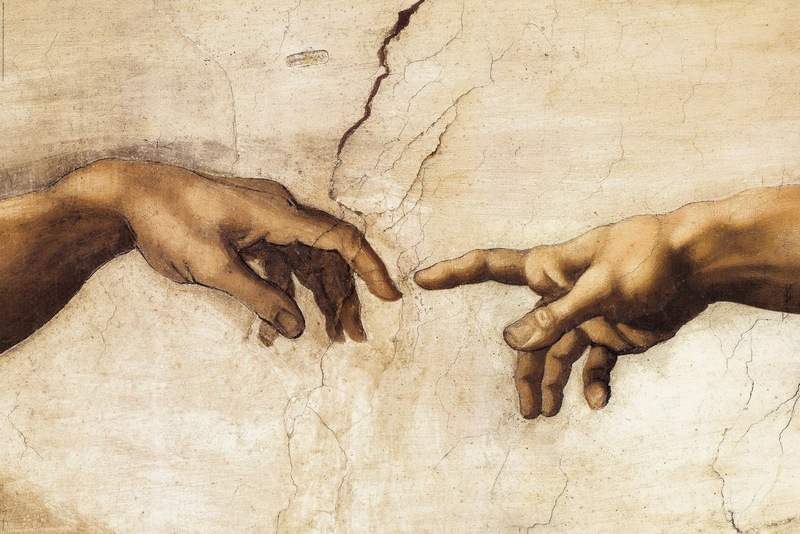 Christ’s right hand is held very much like the hand of Adam in Michelangelo’s famous Sistine Ceiling. However, it points in a direction different from that of Adam’s: from right to left, just as the hand of Michelangelo’s God the Father. This combination illustrates Christ’s two natures. He is man, the perfect man, the New Adam. But he is also God, consubstantial with the Father. What Christ is doing in this painting is analogous to the creative action of God the Father. In Michelangelo’s work, God the Father is about to give life to the physically inert body of Adam. In Caravaggio’s work, Christ is about to give spiritual life to the spiritually empty Matthew. He is about to elevate him from his superficial tax-collecting existence to the fulfilling life of an apostle. This masterpiece is also an iconic depiction of the human-divine encounter that takes place in every priestly vocation. When God reaches out to the called man, there is always a moment of decision such as this: Christ unexpectedly breaks into his life and he discovers, in an overwhelming instant of revelation, that Jesus desires him. This realization is often followed by the tension shown in “The Calling of Saint Matthew”: the call of the divine and the pull of the mundane; the beckoning of a new Friend and the clinging of old friends; the freedom of poverty and the slavery of greed; the comfort of daily routine and the adventure of following Christ. The called man finds himself in the middle of a tug-of-war that only he can end. If he responds like Matthew, he will find what Matthew found: the exhilarating joy of following Christ.